Jaundice is a yellow discoloration of the skin, mucus membranes (tissue including that which lines the mouth), and whites of the eyes. Jaundice occurs when excess bilirubin builds up in the blood. Bilirubin is a yellow-brown colored substance in bile. 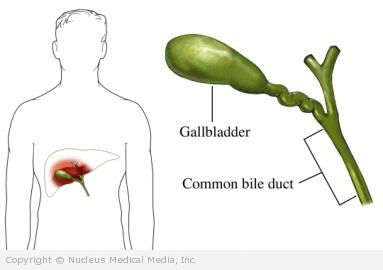 Bile is a liquid that carries waste products (including bilirubin) away from the liver. It also helps break down fats in the small intestine. It is formed during the body’s normal process of breaking down red blood cells. Jaundice appears as a yellow discoloration of the skin, mucus membranes, and/or whites of the eyes. Depending on the specific disorder that causes jaundice, other symptoms may occur, such as tiredness, fatigue, itching, fever, chills, and unexplained weight loss. If you have jaundice, the doctor will ask about your symptoms and medical history. A physical exam will be done. Cholangiography — an invasive test that uses x-rays and a large needle inserted into the liver to examine the gallbladder and bile ducts. It is sometimes performed during abdominal surgery. ERCP test — combines x-rays and an endoscope, which is a long, flexible, lighted tube that is inserted down the throat. This is done to examine the duodenum (first part of the small intestine), bile ducts, and pancreatic ducts. The magnetic resonance cholangiopancreatography (MRCP) test is an alternative to the ERCP test. Liver biopsy — removal of a sample of liver tissue for testing. This is usually done with a long needle. Mild jaundice in newborns is common and usually clears without treatment. If bilirubin levels rise above a certain level, the baby may receive phototherapy, which is treatment with a special ultraviolet light. In Gilbert’s syndrome, jaundice tends to occur during stressful periods and clears without treatment. If you are diagnosed with jaundice, follow your doctor’s instructions. Limit your alcohol intake to no more than two drinks a day for men or one drink a day for women. Be careful mixing drugs, especially alcohol, with over-the-counter and prescription medicines. Avoid exposure to industrial chemicals. Do not share needles or nasal snorting equipment. To decrease your risk of hepatitis A, get the hepatitis A vaccine. To decrease your risk of hepatitis B, get the hepatitis B vaccine.